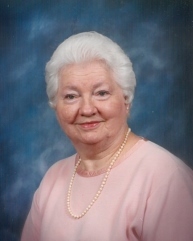 Doris Marie Oyler Wimmer, 91, of Rocky Mount formerly of Roanoke passed away Saturday, November 24, 2018. She was a daughter of the late James Henry Oyler and Mary Jane Moses Oyler. In addition to her parents she is preceded in death by her husband, Joseph Randolph Wimmer, Sr.; a daughter, Katherine Yvonne Wimmer; brother, Hampton Oyler; sisters, Margaret Oyler Ellis, Gladys Oyler Webber, Erline Oyler and Betty Oyler Turner. Surviving are her children, Joseph “Buddy” R. Wimmer, Jr. and wife, Susan Christmas and Judith Anne Wimmer; sisters, Lottie Oyler Turner and Norma Oyler Sheets; grandchildren, Michele Seagroves, Jason Wimmer and wife, Michelle; great-grandchildren, Christopher Wimmer and wife, Hope, Morgan Wimmer and Mackenzie Wimmer; great-great-grandchildren, David Wesley Wimmer and Caylee Marie Wimmer; numerous nieces and nephews.